I used to have an aversion to short story collections. I’m not sure what has changed, but we’re five months into 2018 and I’ve just finished my second of the year. Granted, they’re both works from Stephen King, but I’ll take my little victories however I can get them. 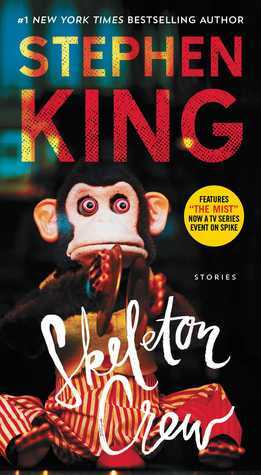 Sandwiched between The Talisman and It, Skeleton Crew was King’s lone release in 1985 and his second short story collection. Similar to his prior collection, Night Shift, Skeleton Crew is mostly previously published work with only a handful of original contributions. The Mist, obviously. This one is the basis of both the 2007 film and short-lived 2017 TV series. It’s been argued that the film has the better ending, and I’m inclined to agree. The book ending isn’t bad per se, but King has even said himself that he wished he’d thought of it. The Jaunt. I heard a lot about this one from fellow King fans – it was actually the reason I picked up the book in the first place. I think this one was my favorite. It details the short history of the use of teleportation and its discovery as told by a father to his children as they wait to teleport to Mars. The ending really freaked me out and stuck with me long after I moved on to other stories. Survivor Type. This was a gruesome read. King writes of a man shipwrecked on an island devoid of vegetation and food. The story takes the form of diary entries written by the man as he struggles to survive. King has even noted that this story goes a little bit too far, even for him. Nona. A suspenseful read about a pair of killers traversing the roads of Maine leaving chaos in their wake. I liked the use of narration as one of the two tells of their actions while residing in a jail cell. Those were the ones that stood out as exceptional stories – the majority were good to OK (Cain Rose Up, The Raft and Beachworld as examples), but there were also a few duds. I didn’t care for There Will Be Tygers, The Monkey or both of the Milkman stories. Several of these stories were written before Night Shift and were likely left out of the collection, which had me thinking they weren’t quite as strong. Outside of Mr. Mercedes, I’ve yet to be truly disappointed by a King release, so even his more average ones are enjoyable reads. I’d choose Night Shift over this one if we just compared his first two collections, but it’s worth picking up – especially for The Jaunt.